Pokédex Entry Appears when disaster comes in a bid to right it. Its menacing appearance is ultimately deceiving, as it is in stark contrast with its normally altruistic nature. 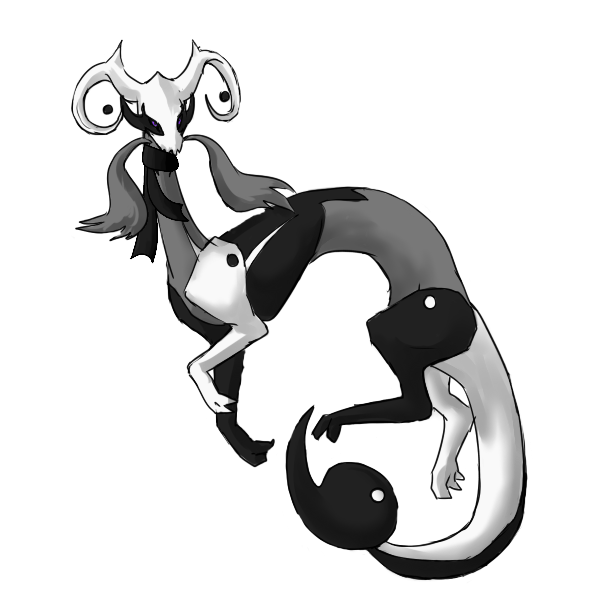 Origin of Name "Dragon" + "Umber"
User Notes This pokemon cannot accept outside help. It believes it and it alone can solve the disaster that attracted it, and thus, refuses to learn TM or Tutor moves. Pokédex Entry This Pokemon appears during times of great strife. Frustrated by its inability to fix the disaster that drew it in, this pokemon has resorted to violence in a last attempt to fix whatever problem faces it. Origin of Name "Wyvern" and "Void"
Pokédex Entry Appears in times of great strife. It has learned that it cannot solve the disaster that drew it. This pokemon is rarely seen in the wild, as often when it reaches this conclusion, it disappears and is never seen again. Evolution Method Does not evolve. Origin of Name "Hydra" + "Abyss"
User Notes It has accepted that the disaster that drew it cannot be defeated or overcome on its own, therefore TM moves and Tutor moves are now accessible.